The Federal Open Market Committee (FOMC) voted unanimously this week to maintain the target range for the federal funds rate at 2.0% to 2.25%, a decision widely anticipated by market participants. As this was the final FOMC meeting without a press conference, attention was focused squarely on the policy statement, which delivered few surprises. The committee’s evaluation of the economy remains upbeat, with five instances of “strong” used to describe the pace of activity. Notably, the committee indicated that business fixed investment, which expanded at an underwhelming 0.8% pace in Q3, has “moderated”; it had previously been described as “strong”. The statement made no mention of recent financial market volatility, which admittedly receded this week, perhaps as jitters surrounding the future path of monetary policy and interest rates abated somewhat. There was no further adjustment to the interest rate on excess reserves, a relatively new Fed tool for the maintenance of the effective federal funds rate within its target range. Political events took center stage midweek, as the Democrats regained control of the House and the Republicans maintained control of the Senate, largely in line with expectations. While the 2016 election was a watershed political event that marked a clear inflection point in fiscal policy, divided government is inherently less conducive to sweeping change. As such, there seems to be limited potential for further tax reform. Moreover, it is likely there will be sufficient bipartisan cooperation leading up to the 2020 elections to prevent outright fiscal contraction, but not an extension or expansion of the pro-cyclical stimulus enacted at the beginning of 2018. Congress is now gridlocked through 2020, which raises risks on a variety of fronts. A few tests loom on the near term horizon. Currently 25.0% of discretionary spending for the 2019 fiscal year is under a temporary funding agreement until 7 December. The current Congress will likely kick the can into early 2019, which sets up a potential funding battle and the risk of a partial government shutdown in the New Year. Government shutdowns are a risk with a divided government, but typically these do not have a meaningful impact on economic activity. An important fiscal test is the debt ceiling, which is set to be re-instated in March 2019. It must be raised or suspended again to prevent a debt crisis or huge fiscal contraction. It is likely Congress will come to an agreement to avert a crisis, but there could be some fireworks in the process. Additionally, Congress must enact legislation to avoid automatic spending cuts of USD100 billion in 2020. The ISM non-manufacturing index came in slightly below the 21-year high reached last month, but at 60.3 it still indicates a robust pace of expansion. Elevated readings for the order backlogs and supplier delivery components point to tight supply chains and gradually building prices pressures. Indeed, the prices paid measure was above 60 for the 10th consecutive month. The current conditions and employment components both fell 2.7 points, but at 59.7 the latter remains consistent with solid employment gains. Indicative of labor market strength were JOLTS data that revealed the number of job openings exceeded the number of unemployed persons by over one million in September, the month during which the unemployment rate fell to a 49-year low of 3.7%. US oil prices fell from their previous peak of USD76.41 a barrel to USD60.67, roughly a 21.0% decline, which placed them in a bear market. After reaching four-year highs in early October, oil prices went into a downward spiral due to uncertainty surrounding global economic growth and rising production. In addition, the Trump administration’s recent decision to issue temporary Iranian oil import sanction waivers to eight countries and recent data showing a rise in US oil inventories put downward pressure on US oil as fears of oversupply increased. Following suit, Brent crude oil is also moving closer to bear market territory, recently falling 19.2% from its four-year high in October. Global stocks fell Friday as oil prices continued to lose steam and markets viewed falling prices as a sign of a weakening global economy. Last Monday, the Trump administration levied a second round of economic sanctions on Iran (targeting its oil, shipping and banking sectors) in an attempt to stop its actions in the Middle East opposed by Trump. In addition, SWIFT, a global financial-messaging service that facilitates cross-border transactions for financial institutions, was ordered to halt transactions involving some of the blacklisted Iranian banks. To ease the impact on countries trading with Iran, the US granted temporary waivers to eight governments (China, India, Italy, Greece, Japan, South Korea, Taiwan and Turkey) that will allow them to purchase Iranian oil for six months, easing fears of a supply shortage. In response, Iran’s president, Hassan Rouhani, vowed that the country would break the sanctions as it deems them unfair. US stocks were higher but gave back a portion of their gains at the end the week. The large-cap indexes outperformed the technology-heavy Nasdaq Composite Index and the smaller-cap benchmarks, and slower-growing value stocks outpaced higher-valuation growth shares. Within the S&P 500 Index, health care stocks outperformed. Provider and insurer shares rose on Wednesday after the Democrats won a majority of seats in the House of Representatives, seemingly assuring a continuation of subsidies under the Affordable Care Act. Communication services stocks performed worst, held down by late declines in Netflix and video game stocks. Energy stocks were also weak, dragged lower by a sharp decline in oil prices. The mixed economic data and the lack of surprise in the election outcome kept longer-term Treasury yields roughly unchanged for the week. Municipals saw heavy investor demand early in the week, coupled with limited supply from new issuance, which led to elevated activity in the secondary market. While the issuance calendar was expected to pick up in the following week, the anticipated drop-off in supply leading into the holiday season suggested a positive technical environment leading into the end of the year. CPI data for October will be released this coming Wednesday. They are expected to rise 0.2% in October (unchanged at 2.2% year-on-year). On Friday, manufacturing production data is scheduled for release. Optimism remains high, suggesting both retail sales control group and manufacturing production could rise further. The UK services PMI fell more than expected in October. The PMI index declined to 52.2 in October from 53.9 in September. The consensus expectation was 53.3. At 52.2 the services index signals the slowest rate of business activity expansion since March this year, when activity was adversely affected by cold weather. Services sentiment was pulled lower by a weakening of incoming new business and current business activity. According to the survey, respondents noted that heightened economic uncertainty and a soft patch for new work had held back business. The growth in new work fell to its weakest since July 2016. The backlog of work fell into negative territory again. The employment index also fell in October, but according to the survey, that might have been partly due to a lack of skilled candidates to fill vacancies. Input prices had increased again in October, which was mainly linked to higher fuel bills and rising staff wages. Intense pressure on operating margins had persisted in October, according to the survey. The sub-index measuring future expectations fell further in October, and is currently at its weakest since just after the Brexit referendum. 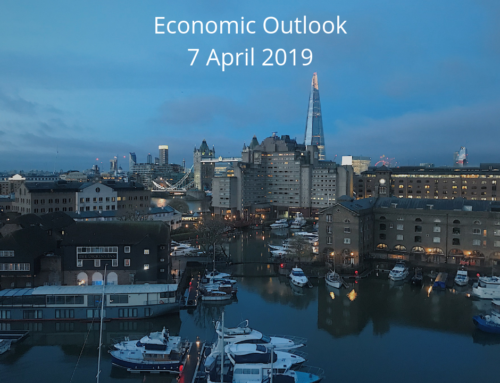 Many respondents saw a deepening malaise due to Brexit-related disruptions and general concerns about the economic outlook. Britain’s high streets are losing shops, pubs and restaurants at record rates in the most testing retail and leisure climate in five years, research by PwC showed on Friday. A net 1,123 stores disappeared from Britain’s top 500 high streets in the first half of the year as only 1,589 shops opened, compared to 2,682 closures. The September jobs report is due out on Tuesday. The unemployment rate (3M average) is likely to remain unchanged at 4.0% and weekly earnings excluding bonuses (3M average) are expected to rise 3.1% higher than a year ago. On Wednesday, CPI inflation will be released but this will probably not change the view that the Bank of England is on hold until May. The flash real GDP for the euro zone disappointed when quarterly growth halved in the third quarter to a moderate 0.2% from 0.4% in the second quarter. This result was even lower than consensus forecast of 0.3%. Growth is now the slowest in more than four years, as seen by a slowdown in sentiment barometers as well as soft and hard data. The flash GDP figures came without details, but both private consumption and fixed investments have likely slowed, as suggested by soft numbers on retail sales and industrial production. This is probably partly due to some temporary effects such as warm weather and the new emission test requirements in the auto industry. Italian debt came under added pressure after the EU warned Italy that it is poised to breach the EU’s 3% budget deficit limit in 2020 if the government proceeds with its current spending plans. In issuing the warning, the EU has ratcheted up the pressure on Italy and called its budget assumptions into question. The European Commission (EC) said that it expects Italy’s deficit to hit 2.9% in 2019 and 3.1% the following year and that the Italian economy would expand only by 1.2% in 2019, less than the 1.5% estimate that underpins Italy’s budget plan. In the euro area, the revised HICP and core inflation figures for October are due out on Friday. The initial estimates were 2.1% year-on-year and 1.1% year-on-year for headline and core inflation, respectively, and no revisions to these numbers are expected. ZEW figures for November are due on Tuesday. Current conditions started the year at 95.2 and economic expectations started it at 20.4. In October, these had fallen to 70.1 and -24.7, respectively. In November, some stabilisation of the economic expectations figure is expected, driven not least by the latest signs that a ceasefire in the US-China trade war is becoming more likely. China’s total exports increased 15.6% year over year in October, beating economists’ expectations of a slowdown due to the trade fight with the United States. The strong growth indicates that China is benefiting from healthy global demand and a weaker yuan. Many economists believe that the recent growth in exports is due to increased orders before the tariffs went into effect and is likely to wane in the coming months. China’s imports came in strong at 21.4% year over year, up from September’s 14.3%. In China, it is time for money and credit data. Following a big decline over some time, there have been tentative signs of a turn in money growth. This is noteworthy as it is normally a quite good leading indicator with a lead of three to six months. This is likely to be due to the monetary easing through a lower reserve requirement ratio freeing up more liquidity. In contrast, credit growth has continued to be weak, leaving quite dismal signals for growth in the short term.